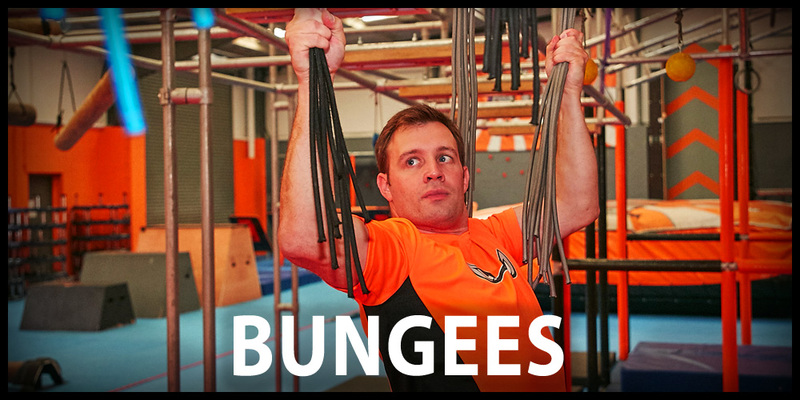 THE BUNGESS ARE ALL ABOUT ANTICPATION – ANTICPATING HOW MUCH GRIP IS NEEDED FOR EACH NEW BUNCH AND ANTICIPATING JUST HOW MUCH STREEEEETTTTTCH THERE’LL BE AS YOU GRASP THE NEXT BUNCH! The bungees are definitely one of our upper body and grip strength obstacles – although you’ll also need good core strength to control your swinging if you’d rather approach it with more of a dead hang style (and who wouldn’t! ).